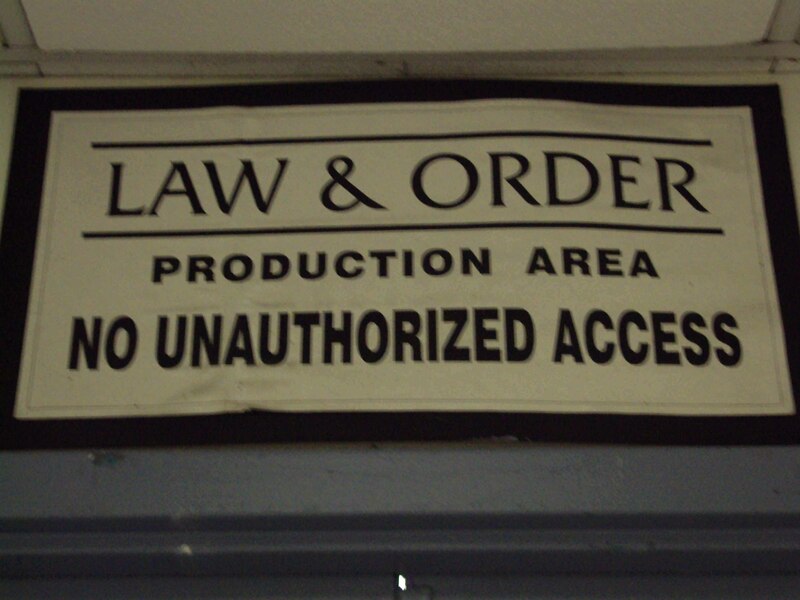 Lame Adventure 48: The Real Reason Why Law & Order was Cancelled – the Elaine Jinx? After work one day last month, I was yogurt shopping in Fairway. My cell phone was on vibrate and buried deep in the pocket of my baggy chinos. A long hand-truck filled with stacks of cardboard trays of more yogurts was parked outside the dairy case. Additional stacks of yogurt trays were piled three feet high on the floor. Clearly I had arrived at the dairy case in the middle of the Let’s Torment the Customers with a Yogurt Obstacle Course, as De Sade, the Yogurt Shelf Stocker, had vacated his post for a break, probably his dinner hour. My preferred brand of yogurt, Brown Cow, had already been restocked, but the stacks of cardboard trays of other brands were completely blockading the aisle in front of the Brown Cow shelves. 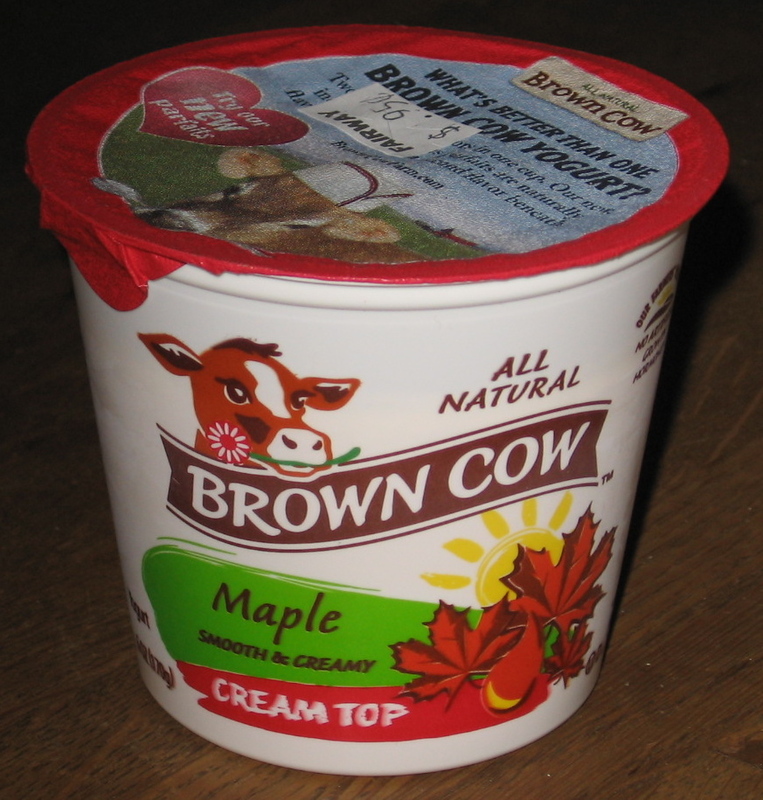 Therefore, I had to strategically stretch over the wide and deep columns of yogurt to reach my cup of maple flavored Brown Cow. A flavor so good it's worth a pulled muscle. As I was doing this, my cell phone dipped deeper into my pocket closing in on a very sensitive area of my anatomy that is normally dormant when I am near Fairway’s dairy case. Just as I was impersonating Elastigirl my cell phone started vibrating dangerously close to that very sensitive area of my anatomy. As a result I began to suffer a genuine moment of unwanted intimate pleasure in this punishing environment that patrons consider the antithesis of ecstasy (see Lame Adventure 15: Like No Other Market). The caller was my friend and colleague, Elaine, my company’s Marketing Director. Her call was unexpected since I had just seen her half an hour earlier when I said good night. Me: I’m shopping in Fairway. What’s up? Elaine: I want you to know that I just spoke to Elsbeth. I gave her a one-month notice. I’ve decided to move back to the UK. She started crying. Then I started crying. Me: Jesus! And Elsbeth was in such a good mood today. Elaine: Funnily enough, I shattered that … You know, you really do sound quite peculiar, like you were strangely exerting yourself. Me: If you must know, I was subject to inadvertent foreplay due to your phone call. Elaine: I never knew I had that kind of affect on you. At my age, that’s flattering. Me (annoyed): My phone was on vibrate. It was more like Abu Ghraib. Why the hell are you quitting? Elaine: You know my dad’s been ill, and my mother’s daft. I have to spend more time over there. Me (light bulb): Did it occur to you that you’re not going to be able to see Law & Order next season? Elaine (horrified): You’re right! I didn’t think of that! They don’t have cable in Banbury! What am I going to do? Me: Tomorrow, rescind your resignation! Elsbeth will be thrilled and all will be right in the world again. Elaine: I can’t! I’ve booked passage on the Queen Mary. I’m sailing June 7th! Me (foiled): Guess you could always follow it on Hulu when you’re back over there. Does Banbury have Internet? Elaine: Yes! What a relief! That’s a lot of bagels, duct tape and she said(s). 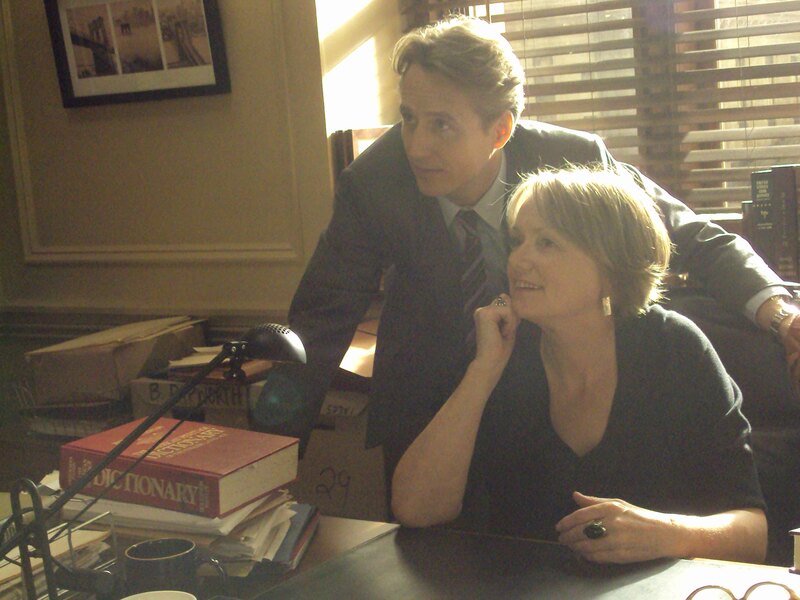 A few weeks before Elaine gave notice, one of her fellow British friends who is friends with Linus Roache, asked Linus if it would be possible for Elaine to visit the Law & Order set, whether the friend played up or down Elaine’s devotion bordering on fanaticism for the show, I do not know. I do know that Linus was instrumental in making this visit happen for Elaine. 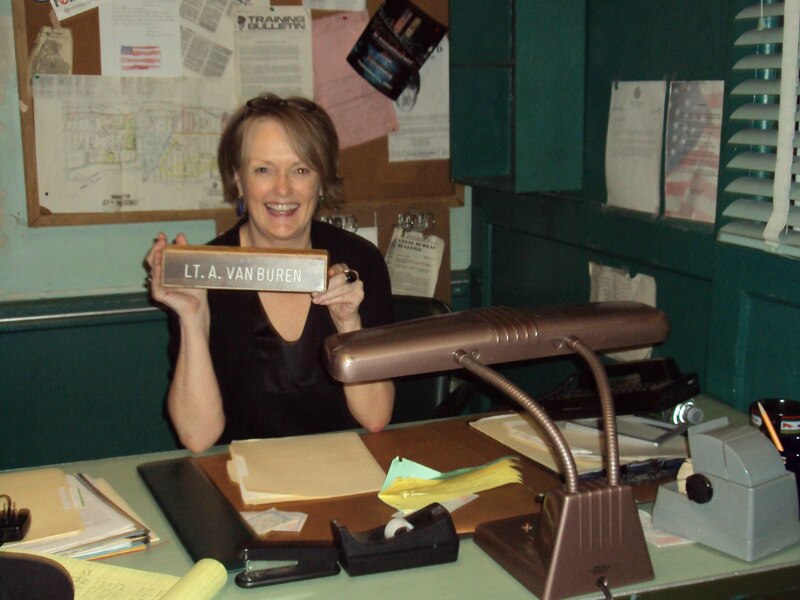 As it turned out, her visit was on April 14th, the day that Law & Order wrapped camera for what we now know was the very last time. Elaine thinks she might have jinxed the show, but I suspect that her karma is so healthy, that visit on that historical day in the show’s history was her reward for being such a terrific friend and colleague. Elaine and her hero, Executive ADA, Michael Cutter. Elaine paling around with ADA Connie Rubirosa. 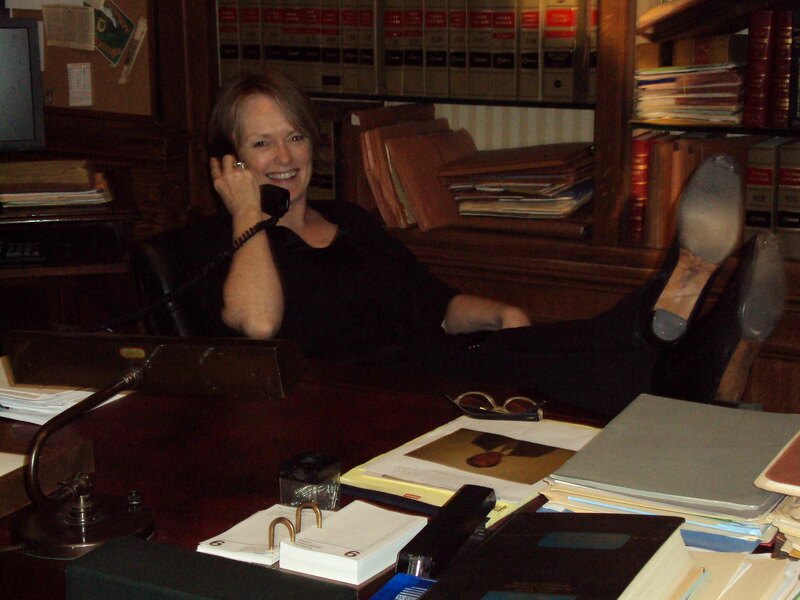 Elaine making herself at home on the set. 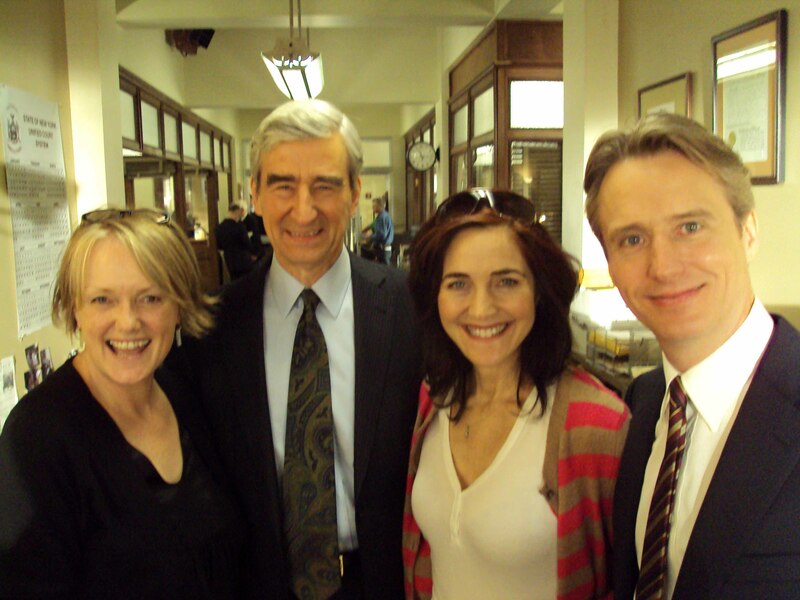 Elaine in disbelief standing next to Executive ADA Jack McCoy. This entry was posted in Humor and tagged alana de la garza, brown cow yogurt, Law & Order, linus roache, sam waterston. Bookmark the permalink. still in shock–I may never recover! I’m surprised Elaine could even stand up! Linus Roache has been making me weak in the knees since his gay love scene in Priest.